In the fictional Warhammer 40,000 universe, the Horus Heresy was a galaxy-spanning civil war that marked the end of the Great Crusade. First described in the 1988 Games Workshop book Realm of Chaos: Slaves to Darkness, it was used as the background for the original "Epic-scale" Space Marine and Adeptus Titanicus games since, providing a justification for inter-imperial warfare, it spared the effort to include different armies in the basic games boxes. 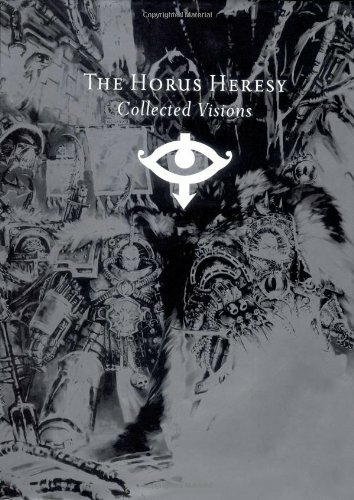 This 416-page thick book is a collection of four volumes of Horus Heresy art books, namely Visions Of War, Visions Of Darkness, Visions Of Treachery and Visions Of Death. It tells the history of Warhammer 40,000, specifically Horus Hersey touching on the major events in a chronological order. It's written by Alan Merrett from a third person view. There's plenty to read and great depth for those looking into understanding more about the universe. Fonts are a bit small though. At 416 pages, this book is filled with illustrations and sketches of warriors, creatures and monsters. The character designs are pretty impressive, it shows straightaway that these guys are created to fight with their meticulous weapons and armour designs. It's a collection of art from different artists like John Balanche, Adrian Smith, Michael Phillippi, etc. At the back is a layout of the cards from the card game. What won't be seen in this book are environment paintings. This is one of the better art books on Warhammer art, at least one that is still selling. It's highly recommended to Warhammer fans and fantasy concept artists.